Story by Nick Lulli. July 14, 2014. It started out as a school project. “I still call it fun money, I’m still enjoying it,” said Cole Watkins. But it quickly turned into a popular activity for folks going down to the Savannah River – or Augusta Canal – to partake in. In 2012, past Augusta State student Watkins was just getting the ball rolling. But, he said, his kayak company quickly blossomed something he never thought it could become. Watkins says his successful business is an indicator of the growing trend of folks going out on our local waterways. “I think it’s fair to say it’s Augusta’s new favorite hobby,” said Watkins. 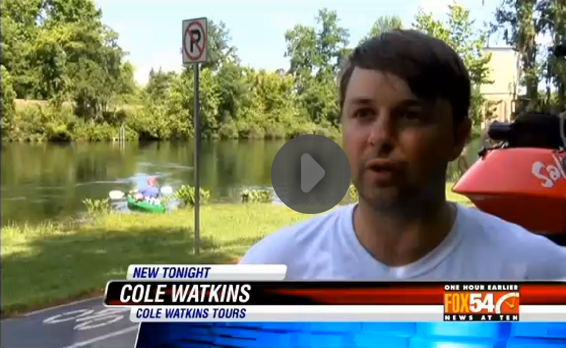 And as for that recent report about how clean – or unclean – the Savannah River is? “I hope that doesn’t discourage anyone from coming down here and playing in it because it’s a great resource for this town,” said Watkins. A great resource that Watkins hopes continues to keep him busy.